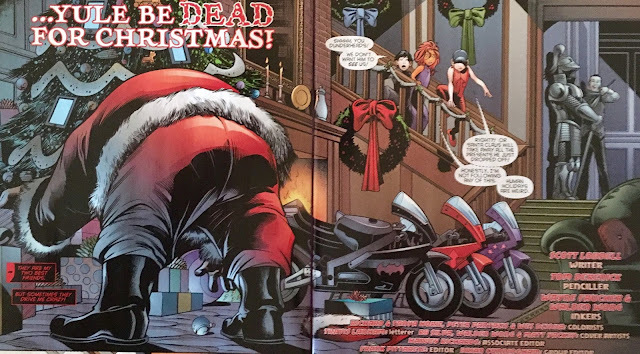 "... Yule be Dead for Christmas!" 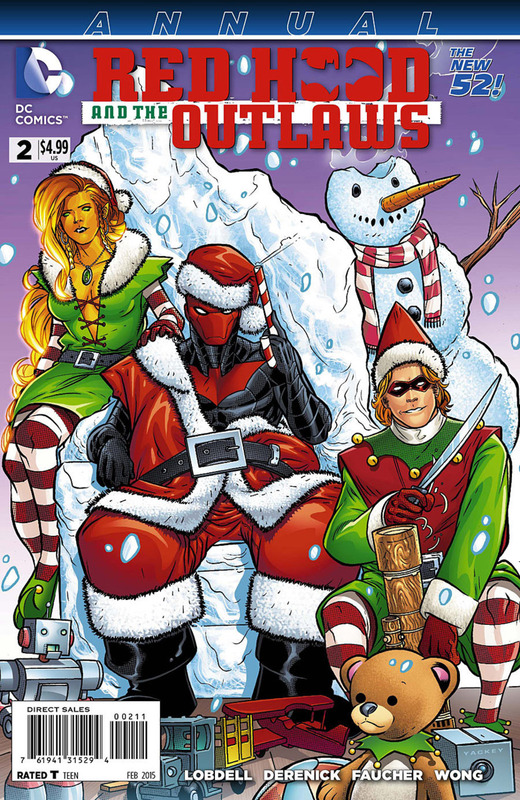 If my math is right (and it wasn't last year...) today marks the First Day of Christmas on Infinite Earths! What better way to get into the Holiday Spirit than reading some old DC comic books with your ol' pal Santa Chris? Well, there are probably tons of better ways... but, this is all I've got! Today we're going to start by checking in with our friends Jason Toddler, Kid'iandr, and Boy Harper! 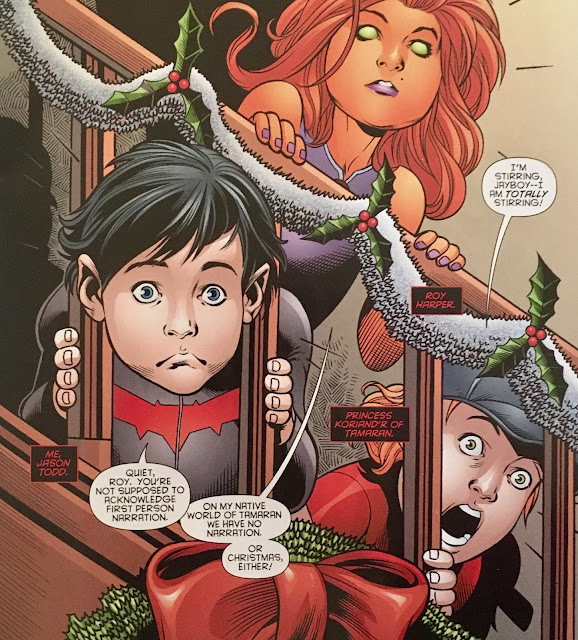 We open on a fairy adorable scene in which the (young) Outlaws are huddled in a stairway watching Santa Claus put presents under the Wayne Manor Christmas Tree. I think this bit here is one so many of us can relate to... having to wait atop the stairs until it was actually "time" to rush to the tree. 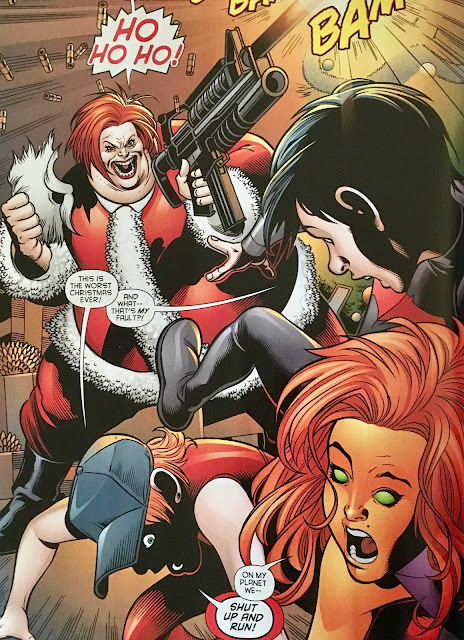 What (hopefully) most of us can't relate to is the surprise Jay, Kori, and Roy find at the bottom of the stairs... this ain't no ordinary Santa... it's Suzie Su! The tots fall back to reconnoiter... and arm themselves to the teeth. 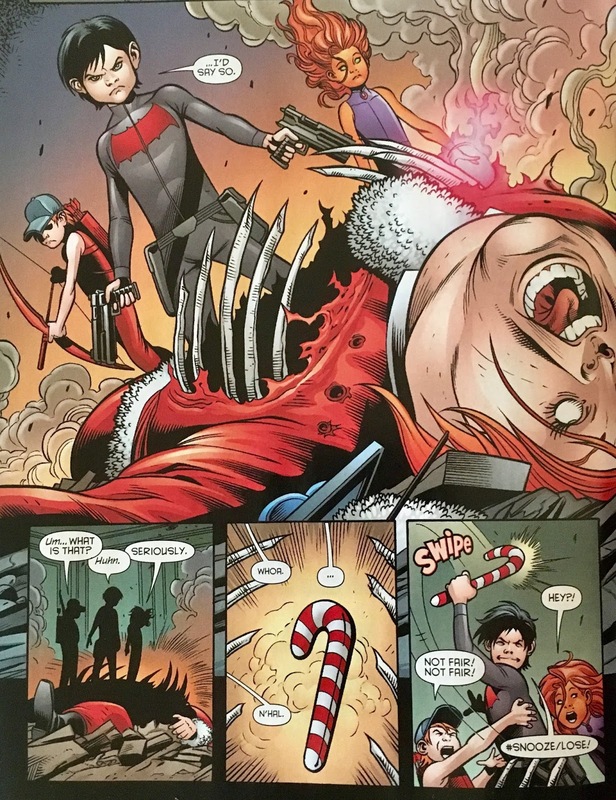 They then rush the Faux Santa... and, well... eviscerate her will ammo. She vanishes, leaving behind a candy cane... which Jason snags. Just as they get snagged, by Batman. To punish them for being naughty... and, ya know... murdering Suzie Su, he throws them into the Batcave. I'm not sure how something like this could ever be considered a "punishment", but we'll allow it. They decide to break out to see if Suzie Su left Santa's sleigh behind. Jason (somehow) brings the dinosaur trophy to life... and they bust their way to the Manor grounds. The dino then vanishes... leaving behind another candy cane. And wouldn'tcha know it, Santa's sleigh is there too! They hop in and fiddle with the controls until Batman bursts back on the scene. 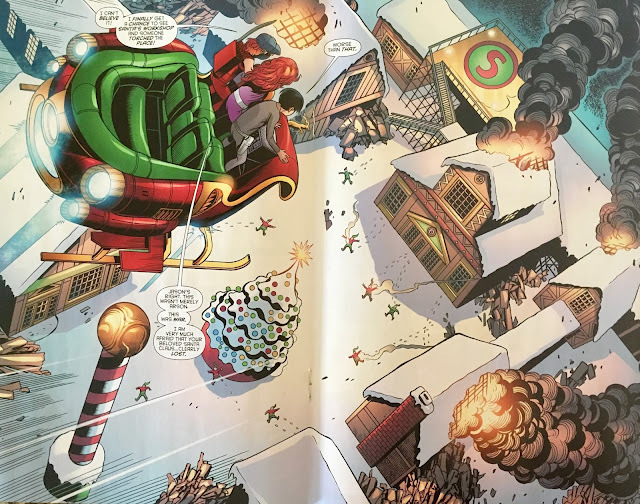 With all hope lost, Roy simply asks the sleigh to take off... and it does! He asks it to take them "home"... as in the sleigh's home. Along the way, Jason begins to suffer with a headache. He's beginning to feel like all of this isn't quite right. After all, they're kids, for one... also, he and the gang didn't even know each other as kids. Anyhoo... no time to worry about silly stuff like that, we're just now arriving to the North Pole! From the looks of it, things aren't all that Merry. The kids land at the sleigh-pad... which is basically a helipad with an "S" on it instead of an "H". They take inventory of all the carnage, and decide their first stop will be the reindeer stables. 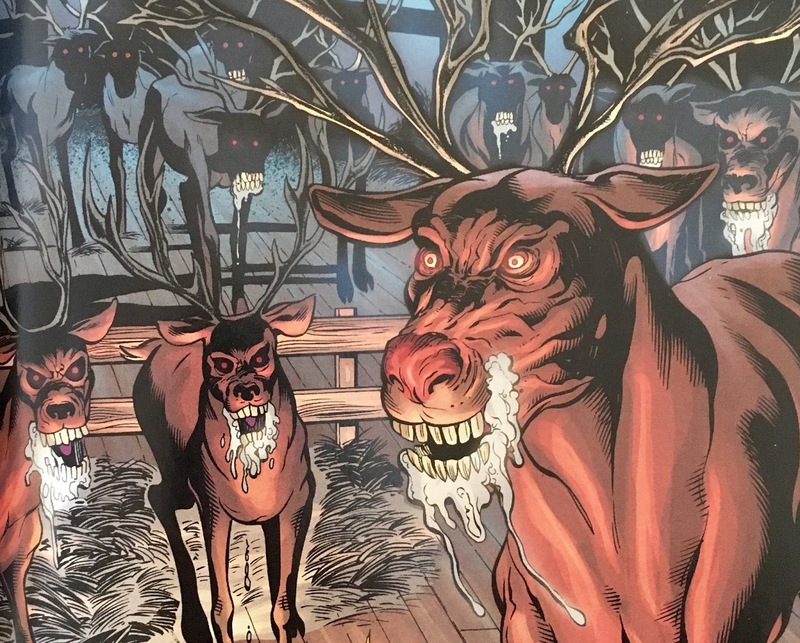 Looks like Dasher and Donner have gotten into the Alka-Seltzer. Jason decides they might want to kill the lights before engaging in wholesale stag slaughter... and so, we get a page of silhouettes doing violent things to rabid reindeer. This ends with the dead-deer vanishing, leaving behind yet another candy cane. Next stop, Santa's Bunker... which is behind a bank vault door. Inside, they follow an icy path which splits three ways. Jason decides it might be best if they split up... which, is probably the worst idea ever, anytime it's suggested... but they do anyway! We first follow Roy as he finds himself surrounded by a platoon (is "platoon" the right word?) of Wooden Soldiers . We get some monologue from Jason... where everything begins to come together. This isn't really Roy... just a Roy that he manifested in his mind. With that understood, "Roy" disappears. 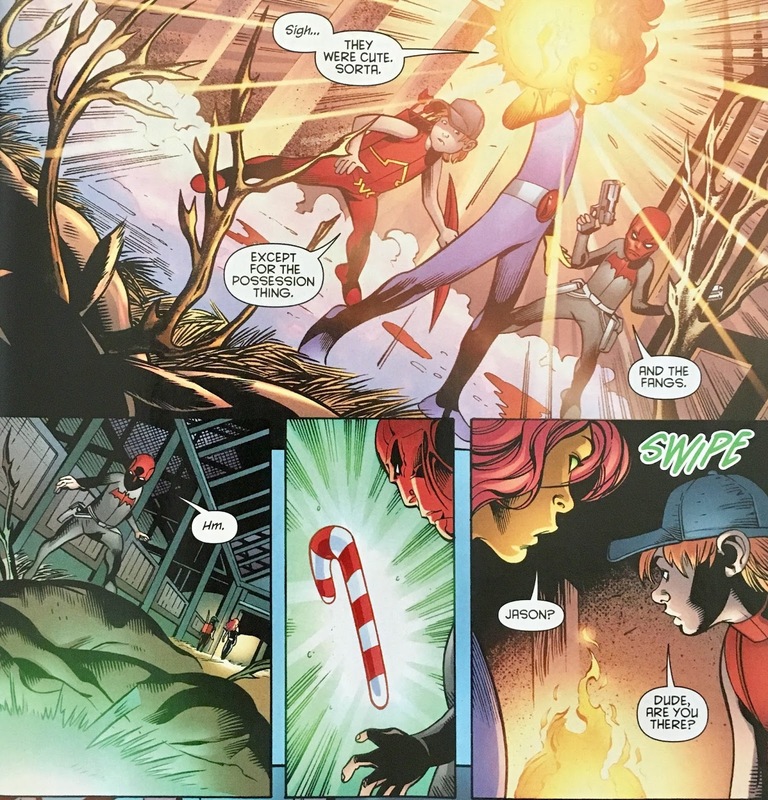 Next, we meet up with Starfire as she is battling a giant gingerbread lady that calls herself "Mrs. Claus". 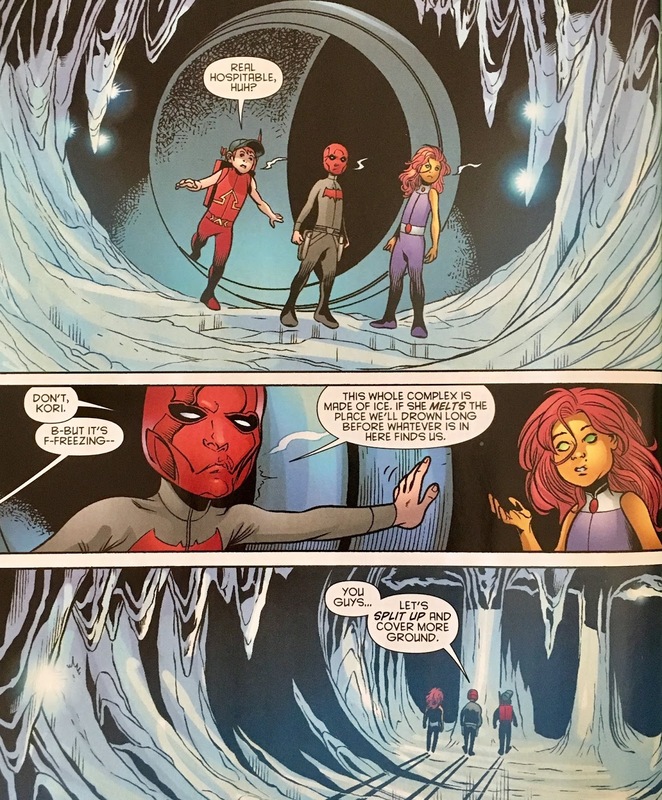 Just as with Roy, Jason realizes that this Kori ain't the real deal... and she fades out too. Finally, we reunite with Jason... who has tracked down Santa Claus! 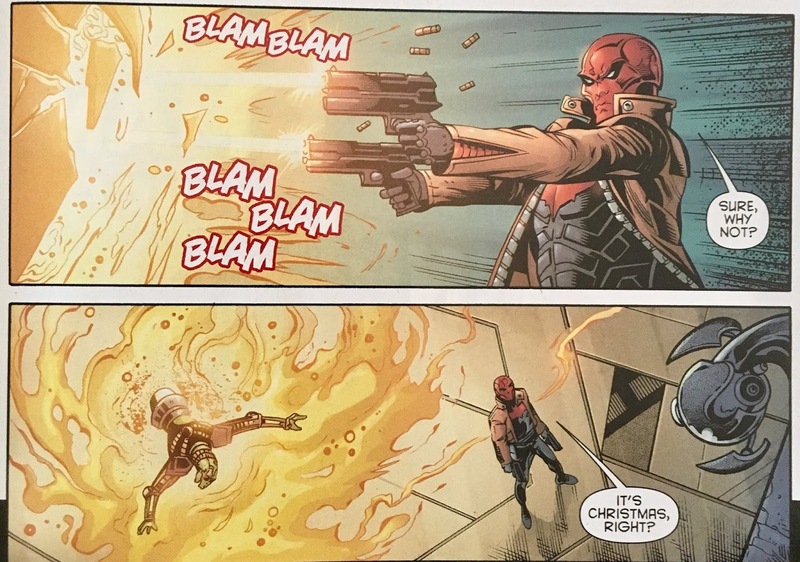 He takes aim with his twin pistols and tries to get some answers. 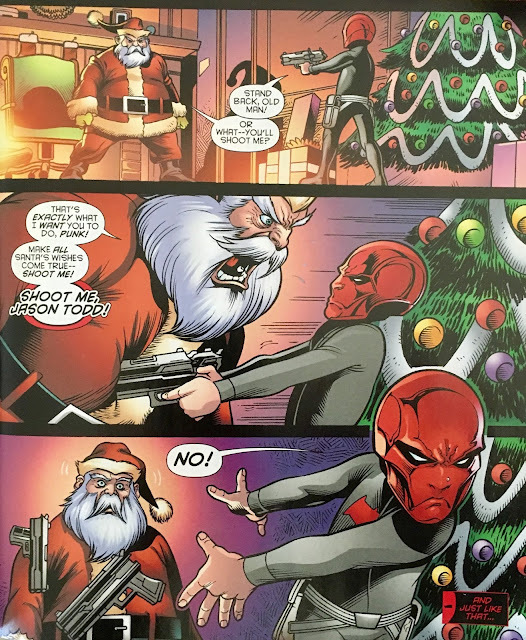 Surprisingly, Santa responds by begging Jason to shoot him! Well, if you're gonna ask for it... you're definitely not gonna get it... yet. At this point the Yuletide vision wears off. What we find is not Santa Claus, but a lizardman called Plytus! Who? I'm glad you asked... he was apparently in charge of experimenting on Starfire while she was in captivity. 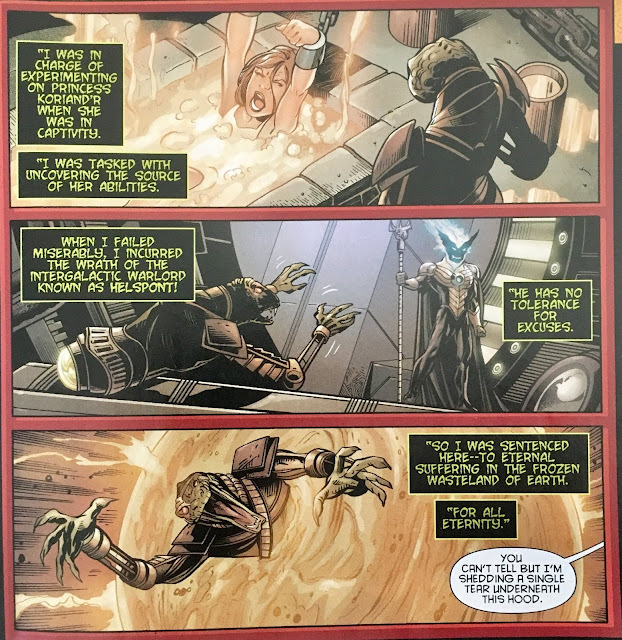 He, of course, failed... and was sentenced to Earth for an eternity of suffering by Helspont. The "candy cane" trail was his way of bringing Jason to him... so he Plytus could be put out of his misery. Jason, amiable guy that he is, grants the lizardman's Christmas wish. He then turns to a security camera and threatens to kill Helspont should he ever come a'callin'. 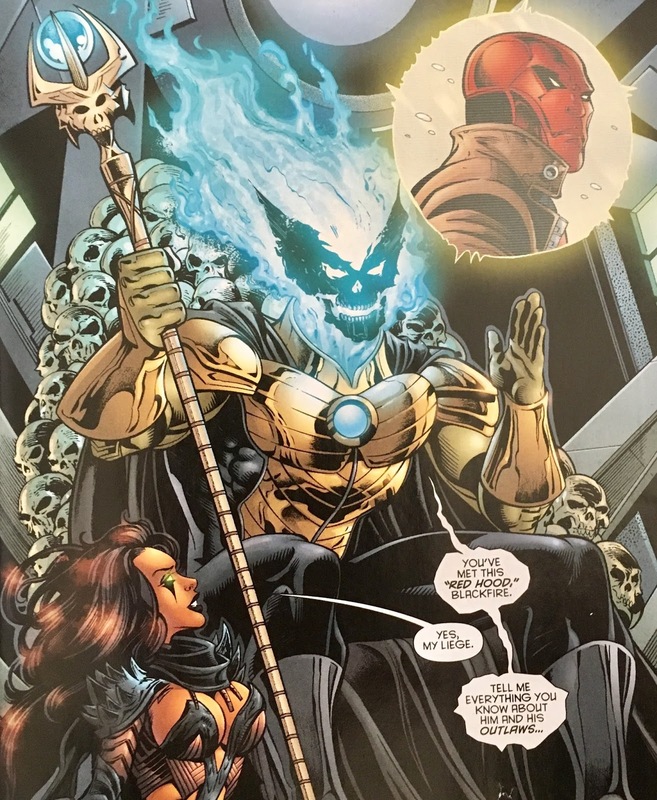 We wrap up with... hey, lookit that, Helspont! 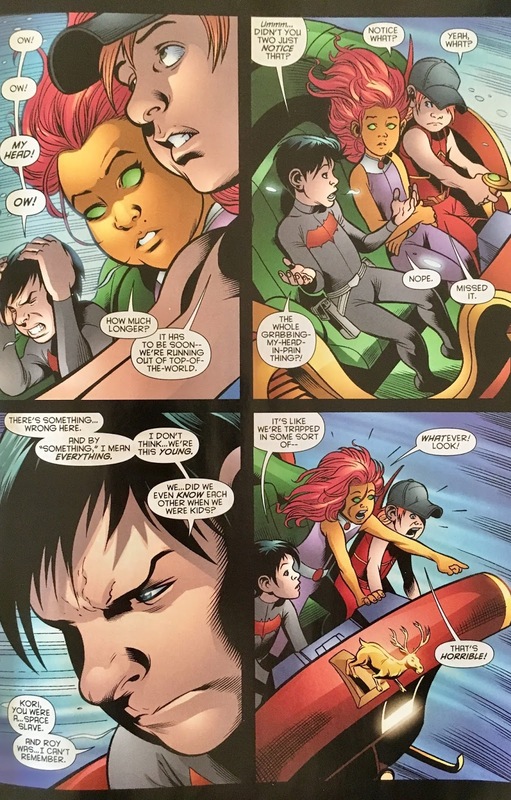 He's with Kori's sister Blackfire, and has just found a reason to become interested in these Outlaws. Not gonna mince words here... I loved this! This was such a fun comic... and such a neat way for me to finally acquaint myself with this team. Red Hood and the Outlaws has been one of those titles I've consistently bought (because Scott Lobdell always gets a "buy" from me... I mean, he wrote Uncanny X-Men #308 after all), but haven't made the time to properly get around to. 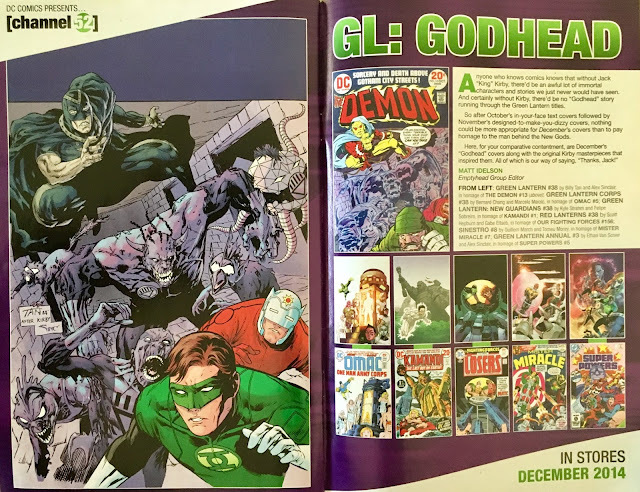 I'm sure I flipped through an issue or three, but never quite hankered down with it. Lemme tell ya, I'm glad I finally did! 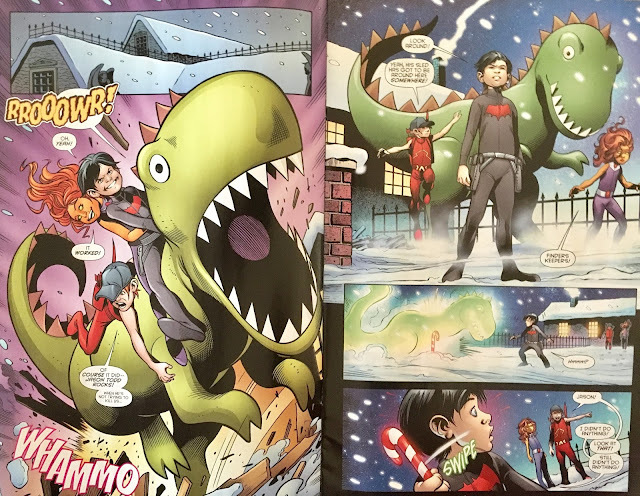 This was fun from beginning to end... and, unlike many Annuals from the Big Two of late, this actually appears to feed into the next storyarc. Tom Derenick provides some adorably wonderful art here... depicting the Outlaws as children... and actually making them look like kids (as opposed to just smaller adults). 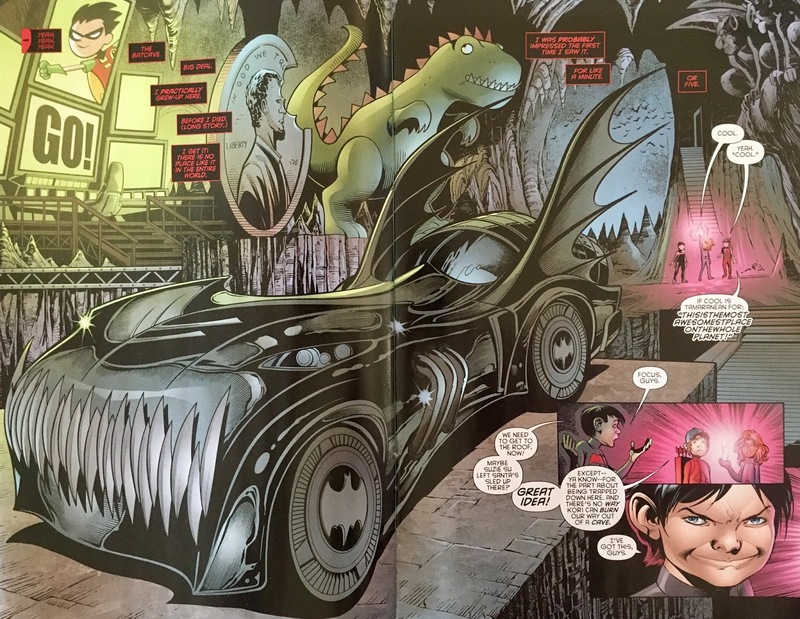 I will normally complain when a book is filled with full-page and double-page spreads... because decompression is a thing, and eating up whole pages without much in the way of substance is one of my bigger pet-peeves. For this issue, however, I really dug it! We don't get stories like this all that often... and it's cool to see that Derenick was really able to flex his muscle here, drawing things we don't ordinarily get to see. 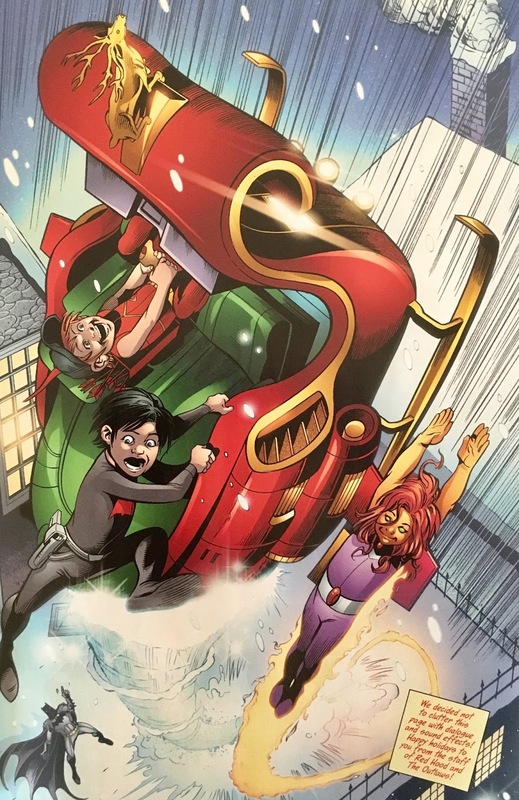 I mean, how often does Santa's sleigh get hijacked by Jason Toddler, Kid'iandr, and Boy Harper? Really just too much fun here. The story itself was a neat one as well. I thought Jason coldly "mercy" killing the lizardman was cool. 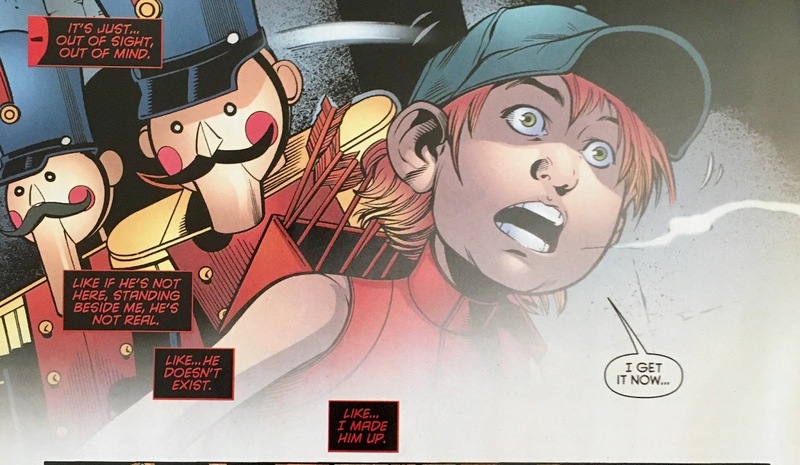 We can look at it a few different ways... did he truly kill him to put him out of his misery... or did he kill him because he's Jason Todd... and that's just what Jason Todd does? The Helspont bit was also cool. Going back to early WildC.A.T.S, I always dug this character's design and since The New-52! began, felt he was a neat addition to DC's pantheon of bad-dudes. If I had a single complaint it would be... well, the same complaint I have about all Annuals... the price point. I'm not sure when we all agreed that Annuals would default to five-dollars... I must've missed that meeting. It's scarily rare that I feel like I got five-dollars worth of story in a single-issue (not floppy) comic book... and as much as I loved this issue, it still feels like it's about a buck too expensive. Luckily, if you wanna grab this one digitally it is currently available for a buck less than cover price. I'd say it's well worth it. You'll have a great time with it! That's all for today... tomorrow, I'm thinking we'll get a bit greedy. On the first day of Christmas on Infinite Earths, I gave to you a Red Hood and the Outlaws Annual #2 Review.